Reverse math thinking for a deeper understanding! This is not a regular math worksheet. 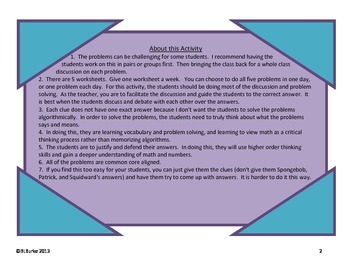 The students cannot solve these problems using standard algorithms. They must use reasoning, critical thinking, and understanding in order to solve these math problems! This is exactly what common core is all about! This file contains 5 worksheets. 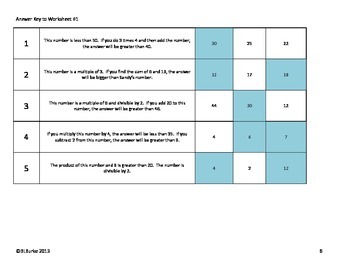 The students are given clues about a number and have to decide whether some answers could be correct or not. Here is one sample problem: If you subtract 7 from this number, the answer is divisible by 5. If you add 12 to this number, the answer is greater than 50. 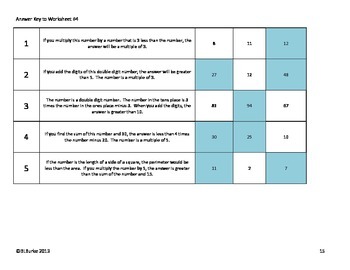 Each clue does not have one exact answer because I don't want the students to solve the problems algorithmically. In order to solve the problems, the students need to truly think about what the problem says and means. In doing this, they are learning vocabulary and problem solving, and learning to view math as a critical thinking process rather than memorizing algorithms. The students are to justify and defend their answers by using higher order thinking skills and gain a deeper understanding of math and numbers by doing this. My students love when I use these in class because they get to actively participate and form opinions. A discussion on just one of the problems could last 15 minutes! 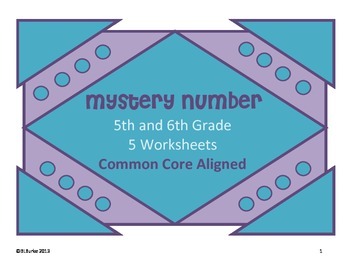 Common Core Math - 5th/6th Grade - Mystery Number Clues by Briana Burke is licensed under a Creative Commons Attribution-NonCommercial-NoDerivs 3.0 Unported License.